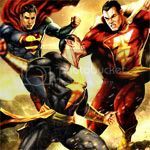 Justice League vs. The Fatal Five isn’t one of the better within DC’s animated movie line, however, it’s still a well told story and the animation looks really good being a continuation of the Justice League animated series line. Justice League: Throne of Atlantis is not DCUA’s best output to date but it’s a perfectly entertaining film with a few flaws, primarily the limited running time. But the voice casting is mostly good, even Jason O’Mara, and on the whole I enjoyed it and some of the darker humor. 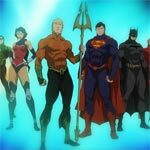 Justice League: Throne of Atlantis is not DCUA’s best output to date but it’s a perfectly entertaining film with a few flaws, primarily the limited running time. But the voice casting is mostly good, even Jason O’Mara, and on the whole I enjoyed it and some of the darker humor and taking the PG-13 rating to the limits in terms of animated affair. I can’t quite recommend this Blu-ray only because even with the other 3 shorts, it clocks in around 60-minutes which is still 10-15 minutes shorter than a feature-length DC Animated movie. I like that they did include commentaries for each short but I would’ve liked a featurette or two focusing on the animation process.